In formulation of Sohan, we decrease intake of sugar by substituting malt (maltose) extracts and sprouted wheat, As sugar (sucrose) is addictive. malt is germinated cereal grains that have been dried in a process known as “malting“. Malting grains develops the enzymes required for modifying the grain’s starches into various types of sugar, including the monosaccharide glucose, the disaccharide maltose, the trisaccharide maltotriose, and higher sugars called maltodextrines. 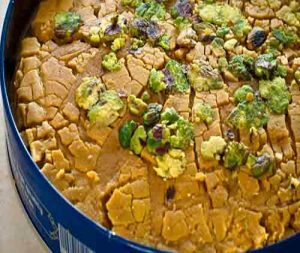 Malted grain is used to make sohan confectionery. In Persian countries a sweet paste made entirely from germinated wheat is called Samanū (Persian: سمنو‎‎) in Iran, Samanak , which is prepared for Nowruz (Persian new year celebration). Malt extract, also known as extract of malt, is a sweet, treacly substance used as a dietary supplement. Roasting sprouted wheat develops unique flavors for baked goods, gravies, roux, dry blends and seasoning mixes. Beacause no additives, artificial colors or preservatives are used during the roasting process, the wholesome integrity of the raw wheat is preserved to help you achieve wholesome, healty foods with enhanced eye appeal. Briess roasted sprouted ingredients are whole grain ingredients that deliver flavor, are high in fiber and help develop foods with healthy, clean lables. Brilliant Pearl ofthe Bay is trying to help people in correction their nutrition. Sohan Iranian confectionery is one of this keys to improve our diet in consumption of confectionery.